Wait, the Pokemon amiibo are useful for something? Mega Man in a platformer? Modern Sonic in a good platformer? What universe is this? That is unfair modern Sonic has been in plenty great platformers. Sonic Advance, Colors, Generations to name a few. Shame this Mario game took the place over MMU. Well that's interesting. Will be even more interesting to see how all the characters look. I wonder if each will retain any of their unique abilities. To wit, the costumes are all cosmetic, but there are sometimes sound cue changes appropriate to the character in question. If only capcom would contract out Nintendo to make a MM game. They have a chummy relationship, capcom did make those Zelda gameboy games. They can't even be bothered to put the Legacy Collection on Wii U.
I guess we have the closest thing to megaman universe. What were capcom smoking when they cancelled it? So now you can play as a 16 x 16 version of Megaman in a Mario game in only one of four different game skins in a "make your own" sort of Mario game with worse physics than Super Mario Bros. All-Stars? Well, between Smash, Mario Kart, and this, Mega Man is appearing in a lot of Nintendo's biggest games for Wii U. It might just be a little something, but it's something. Why the hell are you so pessimistic about this? It's not like Mega Man is a special case, any character with an amiibo is compatible with this. They included it for added customization. Why is that such a bad thing. Why are you so negative about this? Super Mario Maker is good even if it is not released yet. Plus, you can use MegaMan amiibos to play as MegaMan as a costume. 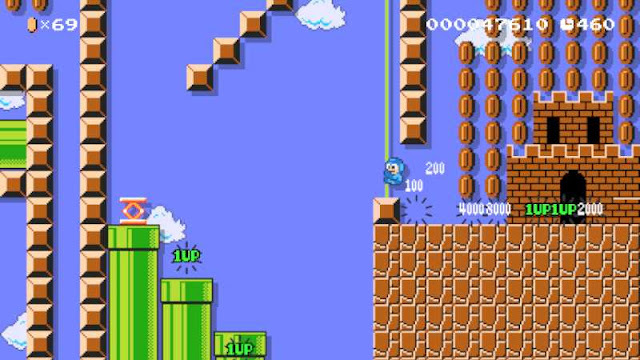 So why are you so negative about MegaMan Amiibo being in Super Mario Maker? I am so buying this game when it comes out. The Mystery Mushroom is a replacement for the Super Mushroom. It lets you reskin Mario (or Luigi...?) to random objects, enemies, or if you choose to do so, an Amiibo. This may also change other things such as the Course Clear fanfare or power-up sounds. It can only be used in Super Mario Bros. levels. I'm not pessimistic about Megaman being included so much as the whole concept of the "Mystery Suits". It seems like a rather shoehorned-in idea, just to help Nintendo sell more Amiibos, not unlike similar functionality in Yoshi's Wooly World. At least with Super Smash Bros, they became companion fighters you could train. 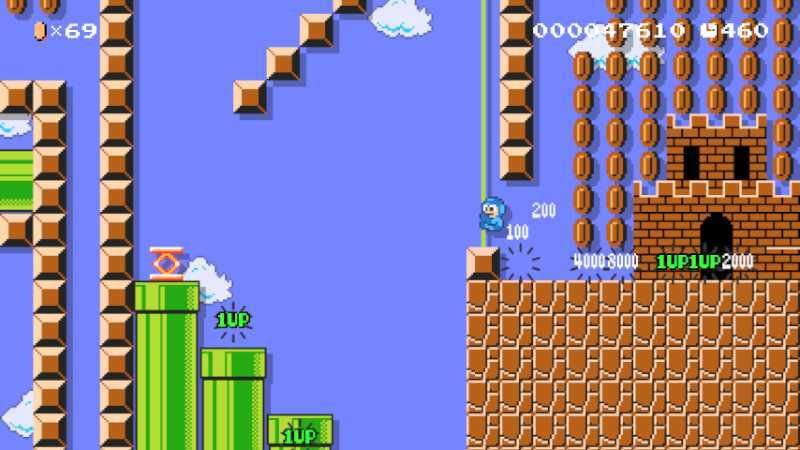 You know it's possible to unlock his costume in Mario Maker without the amiibo right? Literally every character costume can be unlocked without the amiibos, Nintendo confirmed this themselves. And shoehorned why? Because it's only in one mode? They already had to create a large amount of original sprites for each mode, and then potentially a large amount of other ones for the amiibo(not shown in the picture: The AC amiibo which have confirmed functionality). ... why have Amiibo support in the first place? Nintendo could just as easily release the 90+ characters online themselves (and probably will), not to mention there's already unlockable characters in the game like the Goomba, so I fail to see the point of Amiibo compatibility outside of being... well... a pointless gimmick. But at least it's a step up from Yoshi's Wooly World or Mario Kart 8's "Amiibo compatibility", I s'pose. Does it really need to be that big of a purpose? Amiibo are already released and a big hit. They could either do nothing with them, go the other extreme and require you to own the Amiibo to get benefits, or this middle ground where players can unlock the content even without the Amiibo, they just need to play to do it where those with the amiibo can get it instantly. Seems like the best solution overall. You can see it as pointless, but it's not something they had to do at all. They could have just as easily left out all Amiibo, but instead players get a little extra something. I'd rather they capitalize and expand the use of amiibos rather than do nothing at all with them, especially given the lengths some people have to go just to get one figure. And honestly? What's the big dang deal. It's just a cute little addition they added, not something to go on a tirade about. Maybe people here are right that Mega Man fans are whiny, negative pessimistics. ...I wish. ;_; At least it's something. What was Capcom thinking when they cancelled those games? 4 years later and i'm still wondering why capcom did it. This looks nice, can't wait to try it out. Really liking what these amiibos compatible games are doing with Mega man. Postdata: :O the game launches on 9/11. But will he play like Mega Man?